We girls have a never ending love affair with accessories, especially earrings. From pretty danglers to cute little ear studs, we just can’t have enough of them. Despite their small size, they are a style statement on their own and can play a huge role in shaping our ensemble. In our quest to find the next pair of earrings to add to our collection, we came across some fabulous numbers that completely stole our hearts. Here are 8 statement earrings you need to get your hands on now!! When we spotted these beautiful earrings inspired by dreamcatchers, we knew we had to get them on this list. This beauty is all you need to make a style statement wherever you go. Price: Rs 349. Buy it here! If you are bored of chains and repetitive patterns, then try this unconventional solid earring that comes in the prettiest red accent. The columnar design and the minimal floral motifs at the edges make this one a stand-out statement piece. Price: Rs 499. Buy it here! Ear cuffs are one of the trendiest fashion items today and they look SO cool when worn with Indian as well as Western outfits. We love this earring in the style of an ear cuff - and the minimal leaf design is to die for! Price: Rs 295. Buy it here! Get ready to turn a few heads in this beautiful pair of silver earrings. The big bold design paired with delicate tassels make this piece unique and irresistible! Price: Rs 450. Buy it here! This pretty number drops down from the back unlike normal danglers. Love the way the triangular stud sits on the earlobe while the rest of it falls freely. Lift up your basics by including this in your ensemble! Price: Rs 400 . Buy it here! 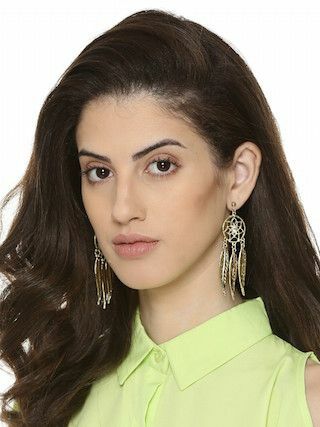 Add a cool element to your look by sporting this breathtaking pair of earrings. The sky blue beads that hang from the gorgeous teardrop top looks like what dreams are made of. We can’t take our eyes off it! Price: Rs 499. Buy it here! If you’re the girl who like to keep things interesting and unique, then this number is designed just for you! Perfect to help you make a style statement if you’re going for a night out. Price: Rs 299. Buy it here! HAVE A STORY IDEA FOR POPxo? If you want to hear about it, we can write about it! Just tell us your idea here! MUST-READ: Super Pretty Rings And Earrings For Just Rs 250?! YES!! MUST-READ: Stunning Designer Jewellery Pieces Every Girl Can Afford!